Have fun with our collection of cat printables. We have a lovely poster, a fun learn to draw tutorial, templates for crafts, and many more! Perfect for a pet animals theme. If you love cats (like me! ), you'll find plenty to write about in this lovely foldable booklet. You'll need to fold your booklet using our easy-to-follow instructions. If you have a pet cat you can write down everything about them in this little booklet - their favourite food, toys and where they like to sleep? Use our folding instructions found here. Children can fill up these cute little cat bookmarks with pictures, writing, messages - or use them as a page record for the latest reading book. Here's a fun little printable cat jigsaw, which takes moments to make and is fun for the kids to reassemble! Another cat jigsaw - this one featuring an illustration of a pretty pet cat licking up some milk. Use our jigsaw instructions and cutting guides to get it ready for the kids, and enjoy. How cute is this cat lacing card? Print, cut out (laminate if you prefer) then punch holes around the edges. Give the kids some wool or shoelace to thread through the holes. Make a cute kitty from playdough to sleep on the cushion on our cat playdough mat. This poor kitty is thirsty! Can the children make her a bowl of milk using playdough? Print our cute kitty cat poster for younger children, featuring a bold cartoon cat. Do you love cats? Print out this cheeky cat poster for display in the classroom or home, or use in your projects. I wonder what this very cute and inquisitive kitten is up to on this poster? Perfect for pet animal projects and displays. Here's a lovely poster of a very beautiful cat! Simply print out and use for topic work or display on walls at home or in the classroom. This cat room sign is a cute and easy way to personalise your room! Simply print, cut out, then write your name in black marker (laminate for extra durability). Here's some printable writing paper for kids who like cats, with a cute cat illustration to cheer up the writer or recipient! This cute writing paper features two gorgeous little cats and is perfect for a thank you letter. We provide three versions to choose from, to suit your children. Cats are a very playful animal, and these two feline friends are enjoying playing with their toys on this fun poster. Perfect for a cat lover's bedroom wall, or as part of a display about pets. We've designed this cats word jigsaw so that you can use it with different ages. For younger children, cut along the top dotted line but leave the letters attached to the bottom row. Children can then use the letters to help them put the picture back together. Here's a little Christmas cat jigsaw - quick to cut out using our jigsaw instructions and cutting guides - and fun to put back together again! 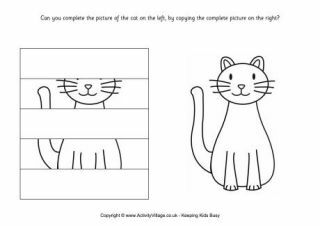 Print this fun Complete the Picture Cat worksheet and get your child to spot the differences between the two pictures, then fill in the missing details. Fun for younger kids. This kitten lacing card has plenty of child appeal! They will love practicing sewing and improving their fine motor skills with our fun printable. Kids can learn to draw a cat with our fun printable step by step guide. Look at the shapes and placement, and then copy along! There are really cute pink cats on this writing paper, to make it more fun to write letters (and to receive them!) Children could also use the paper to write a story. Is your child sleeping or playing? Use our pretty pink kitten door hanger to let people know! How could the kids resist this adorable pink kitten! It's very easy to make this little kitten jigsaw. Just print onto card and use our jigsaw instructions and cutting guides, choosing the appropriate level for your child. Fill in your child's name on this room sign - or better yet, ask your child or an older sibling to do so.